« Tough Day At The Office! Some Days Have More Rain Than Others! Non-stop generation from this past Monday through Saturday. Some days more than others, but definitely some dating time in the mornings over the past three days and today, Sunday, it was off until about 5:00 p.m. Turned on the equivalent of one generator then and, so far, it has been on for a couple hours. Looks like we have no rain in the forecast for the next 5 days. Temperatures in the low 70s Monday, moving into the upper 70s Tuesday, then low to mid 80s Wednesday and Thursday and back into the mid 70s by Friday. Nice! Jim on the water this past Wednesday with Houston and Debbie, from Florida. Debbie is a new fly fisher, so Jim spent ime working with her. Their patterns were the red midge and a red San Juan form. Thursday, Stan had Mike, from Iowa, out for half a day. He’s tough! That’s what I told him when he came into the shop in his rain gear and it was raining. They had a wet half day catching fish on the red midge. Not a great great day, but they caught several fish. Although the sun was out, this was another rainy day for Stan. He had Terry Terry and Doc from Oklahoma out all day Friday. Less than half way through the trip, Stan’s anchor fell off. Since the water was running, he needed that anchor to lay up. Terry did some Ozark rigging and came up with a make shift anchor to get them through the day. When everything settled down, they did catch some fish on the red San Juan worm. Jim had a half day with Matt from Parkville, and Dana. Pretty good day for these guys. Carolyn had Ron and his son, Brian, out for the day. Started out a little slow, but certainly picked up. Good day of catching on the red San Juan dropped below the big ruby. 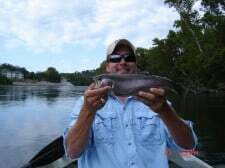 Brian’s biggest was a 17″ rainbow. Darrell had Jeff and his son, Nate out for the morning. Nate is certainly turning into quite a fly fisher. Their best flies were the red midge with the red San Juan dropper. Nate boated a nice 18′ rainbow. Dana had Buzz from Florida on the water Saturday for half a day. Pretty good day on the holograpnic green crackleback and a size 16 fl. pink San Juan worm. The Louisiana Kerrs were here Saturday. They stopped and fished the White on Friday with guides out of Arkansas and had a very good day there. 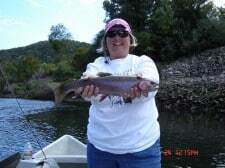 Dawn landed a 25″ brown on a hopper. Was she pumped! Good job Dawn. Saturday, Dawn fished with Carolyn and the guys, Albert and James Albert fished with Darrell. No big browns for us, but, Dawn had a good day on the big ruby with the primrose & pearl dropper. A very respectable number of fish on this including a pretty 19″ rainbow. We also caught some on an olive wooly bugger, the holographic green crackleback and a size 18 black zebra midge dropped below the big ugly. Darrell’s guys best patterns were the red midge and the red San Juan worm. Talked to several fly fishers today who were fishing because there was no generation today. Pretty happy with the fishing. Catching on several patterns including holographic green cracklebacks, black zebra midges, size 14 Hare’s ear numphs, and size 16 gray scuds. 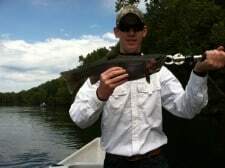 This entry was posted on Sunday, September 25th, 2011 at 9:29 pm	and is filed under Fishing Reports. You can follow any responses to this entry through the RSS 2.0 feed. You can leave a response, or trackback from your own site.